The future depends on how well we’ve preserved the past. Tomorrow’s breakthroughs are built from today’s innovation. To continue the trend, we must keep preserving information properly for future generations. If we leave indecipherable records, important knowledge is trapped in plain sight. While we’ve made progress, the dream of completely preserving knowledge across generations escapes us still, and digital bits are particularly vulnerable. There’s no guarantee our digital tools will be available forever—even a century from now. And without them, much knowledge and culture will be inaccessible, left rusting away on impenetrable hard drives. The Long Now Foundation focuses on this vision of long-term cultural preservation, and the preservation of language—a prime tool of culture—is central to their quest. “Fifty to ninety percent of the world’s languages are predicted to disappear in the next century, many with little or no significant documentation,” according to Long Now. 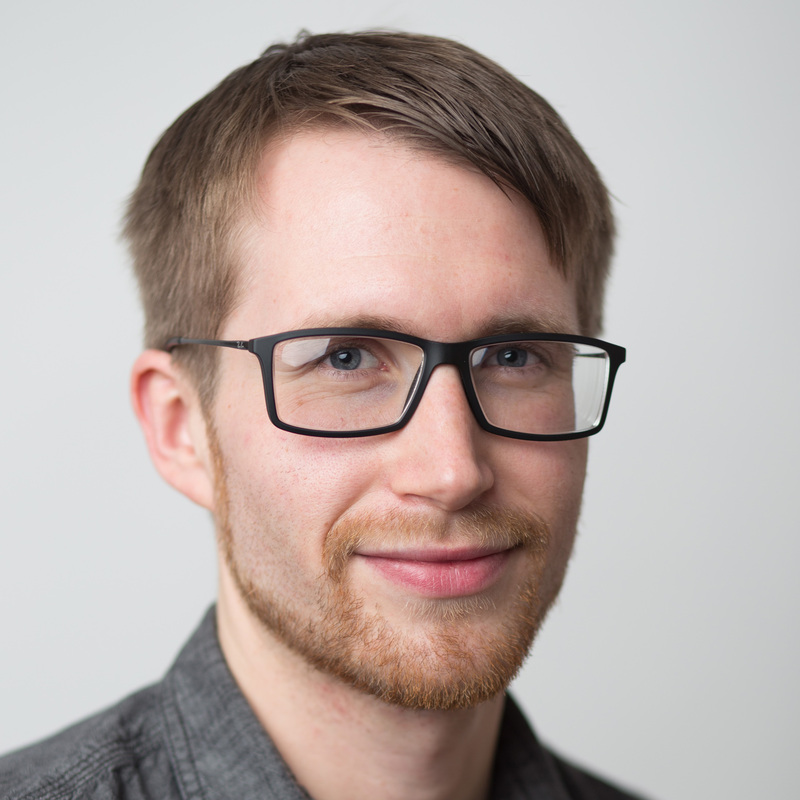 To save these languages, the foundation invented a rather ingenious solution. 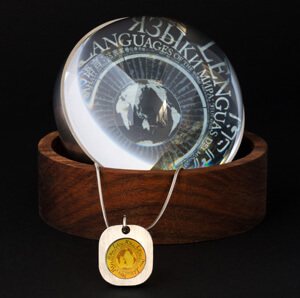 Embedded in a sphere of steel and glass, the “Rosetta Disk” is a physical disk containing over 13,000 pages etched with information on over 1,500 different human languages. The disk itself is made of electroformed nickel, contains useful information down to the nanoscale, was built to withstand multiple generations, and only requires basic technology to read—a microscope. That is, massive amounts of critical information stored away, no computer required. Depending on what the future holds, the Rosetta Disk may be the only chance for certain languages to survive beyond living members. But there’s only a few such disks. So, the Long Now foundation decided to simplify, miniaturize, and distribute. Now, anybody can own and wear the Rosetta Disk on a necklace. 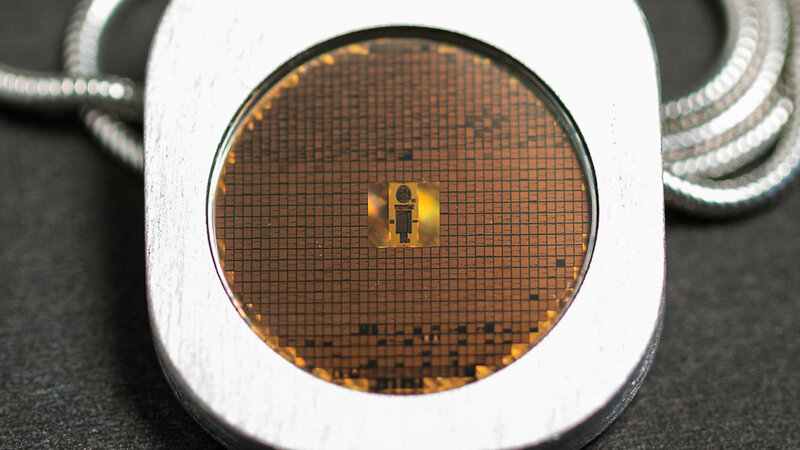 Shrunken down to a wearable size of two centimeters in diameter, the Rosetta Wearable Disk gives anyone the ability to wear the key to human language for future generations. While the disk itself is a little pricey—a $1,000 lifetime membership donation to the Long Now—the value of the information and efforts behind it is immeasurable. 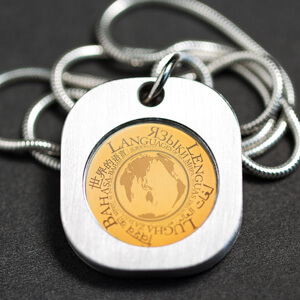 For now, the wearable disk is only available as a limited numbered edition. Over time, we’ll see how the project unfolds. But you don’t need to own a disk to access the library. The archive is freely available online, including an interactive graphic for browsing.